There exists a conspiracy against the Generalist. Today's culture rewards those who Specialize: doctors, athletes, teachers, cops. 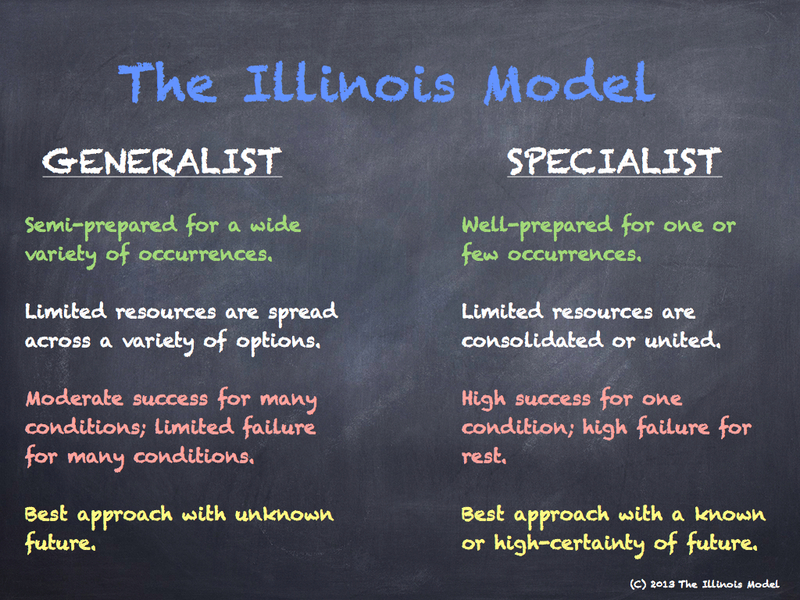 Being labeled a Generalist comes with ridicule of being luke-warm, a moderate, uncommitted, or without passion. Those images are false. They are hallucinations. Time and time again, life penalizes the Specialist. We never learn from our mistakes. Striking a balance between being a Generalist or a Specialist hinges on one factor: one's confidence in the future. 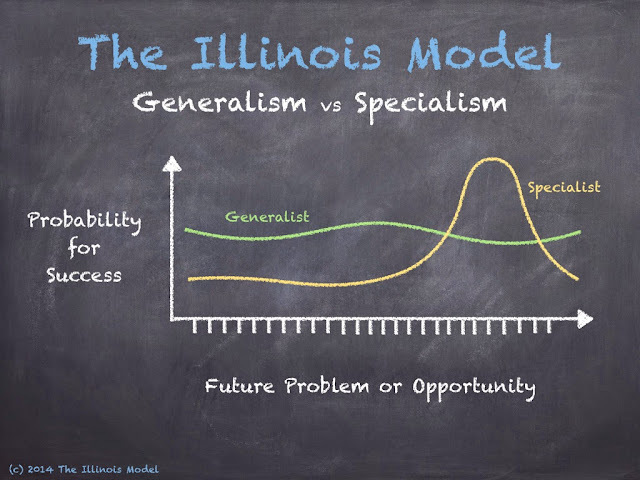 The equation is quite simple -- the greater the predictability of approaching problems, the more one should become the Specialist; the less foresight one has, the more benefit in being the Generalist. This axiom holds for any aspect of life: financial investment, medicine, emergency preparedness, physical fitness, backcountry camping, education, gambling, and of course....law enforcement operations. As with most of our theories, this is a spectrum bookended by two extremes. 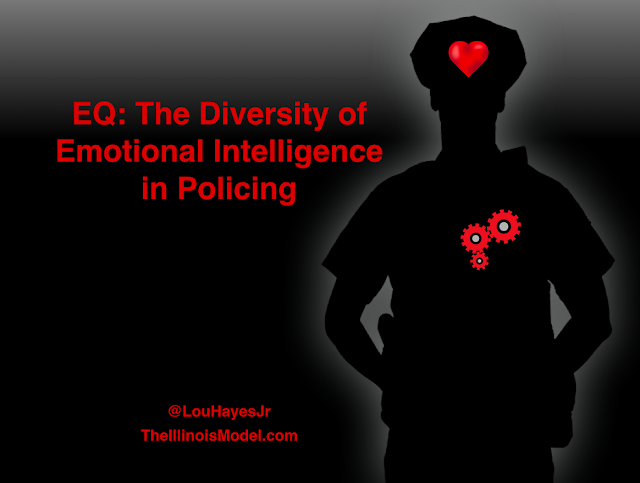 With a firm understanding of the spectrum between the Generalist and the Specialist, police officers can more effectively and efficiently prepare for a future that is both unknowable yet speckled with predictability. Imagine receiving orders to perform a hostage rescue. Better yet, your team is given six months notice. The orders are so explicit that you even know the exact location, the floor plan of the building, the identity, background, and motivation of the sole hostage taker, and a complete workup of each of the five hostages. How would you prepare? Given the high confidence in the future, officers take a very specialized preparation plan: crisis negotiators detail a strategy, entry officers build a to-scale replica of the location for rehearsals, snipers dial in their scopes to exacting distances. The team details their response and actions to a very known set of circumstances, with extremely tailored tactics for the situation. As silly as the above story sounds, there are elements of reality that accompany it. In the military special operations world, something quite similar takes place before major raids on terrorist compounds. Even in SWAT rescues, entry teams practice for even a few minutes or hours in units with identical layouts on a different floor or part of a complex or neighborhood. Negotiators have certain default profiles of potential offenders or people in crisis to more effectively address their worldviews. These examples all inch toward becoming a Specialist. But with an infinite number of potential problems, tacticians must first be Generalists. Strategies and tactics must be broad and rooted in a finite number of concepts. Operators must become jacks-of-a-number-of-trades. 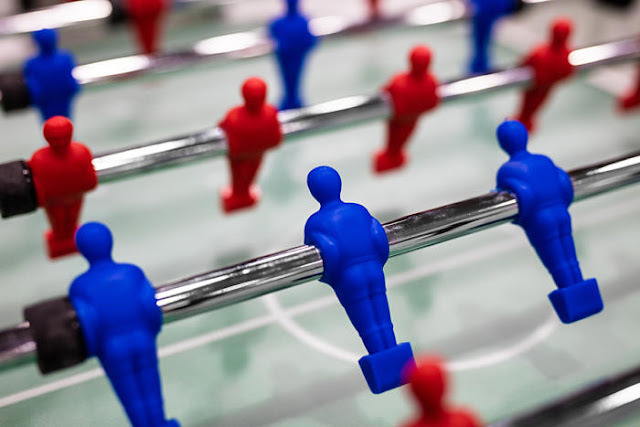 Tactics, formations, and movements must be universal enough to be applied in a wide variety of situations...situations where, if given the time and notice, a more detailed or specific tactic might be perfected. Here is where we see the balancing act of Accuracy versus Time. So where do we go from here? As I continually argue, we have identified six team concepts: Priority of Fire, Crossfire, Cover-Maneuver, Flanking, Back-to-Back, and Cross-Clear. 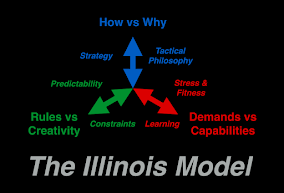 Understanding these six concepts is the foundation of being a tactical Generalist. Each combination or application of these six skills take police and military tactics one step closer to Specialization. Of course there are certain elements of predictability in the future as a law enforcement officer. Buildings such as homes, apartments, or offices will all continue to be venues for police incidents...and all have certain "repeatable" aspects in their design. The same goes for residential neighborhoods and highway vehicle stops. These are locations and terrains that build predictability. We also know that certain categories of criminal incidents, such as active shooters, lone barricaded gunmen, fleeing armed felons, hostage takings, and officer down rescues will continue as the big threats we face. Because we can predict some of the problems and some of the terrain, we can take some ground from General toward Special. How do we teach and practice these six concepts? 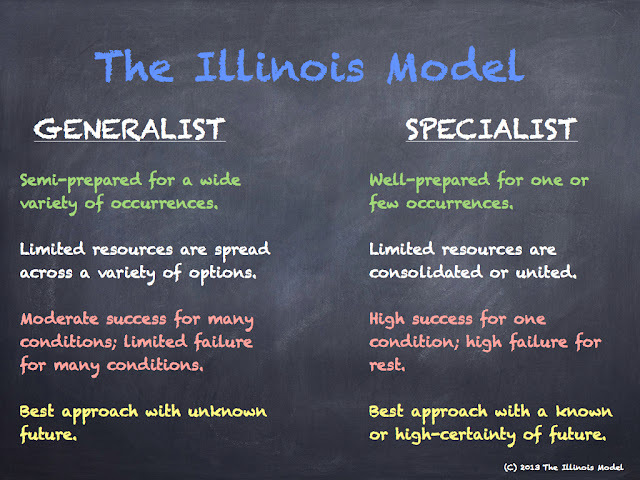 First off, we introduce the Generalist v Specialist theory up front. We explain to those students who have been accustomed to practicing specialized techniques or methods that we must revert back to generalized and concept-based tactics. That can be quite a departure from their previous police training experiences that may be focused on trying to standardize a formation or movement. In fact, many officers begin with resistance to concept-based tactics -- they are programmed to being told exactly how to respond by their instructors. We do not hold to that sort of programming. That's it. Well not completely. But close. Over the course of our program, we use scenarios and situations that require a broad and diverse application of our strategies and concepts. The scenarios range from outdoors to indoors; from urban to rural; from slow to fast paced; from rescues to arrests; from spread out to confined areas; from small teams to large teams; around vehicles; in neighborhoods. We use those specks of predictability as a guide for our scenario development. We must remain vigilant to stay at the Generalist end of the spectrum as much as possible. 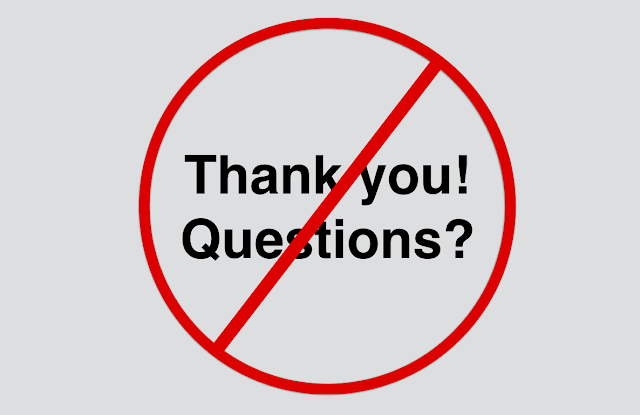 When our instructors are drawn into questions of "what if____?" we must remind ourselves to delineate our answers using a Generalist v Specialist argument. That "what if" question often pulls us into a trap of making a narrow decision as a Specialist. 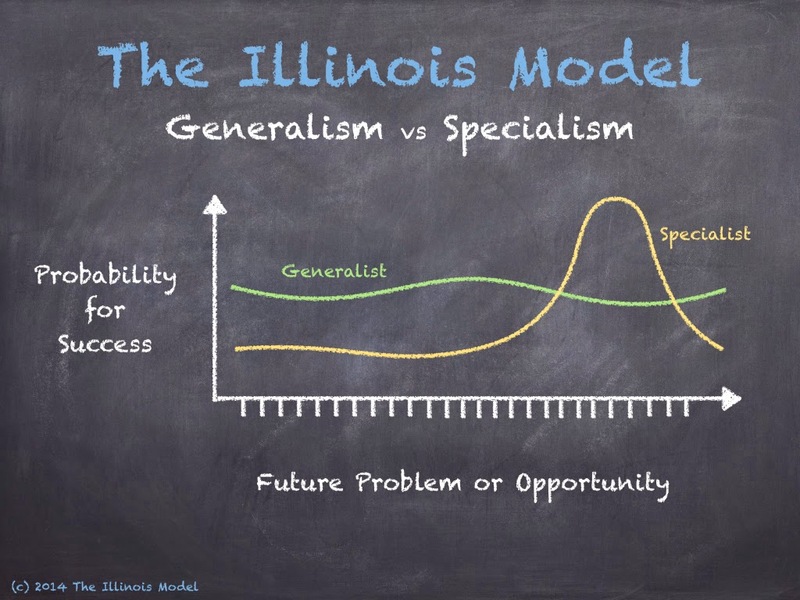 Given the limited time, money, and resources that we have to train and prepare our students, we firmly hold that the Generalist approach is best. Because we are committed to tactical response in an unknown and unknowable environment, we must arm ourselves with universally applied team concepts. As our missions become clearer and more predictable (and our training resources become more plentiful), only then can we move closer towards becoming Specialists. History proves my theory. Life favors the adaptable.